In all my life I have never gone cherry picking. I guess that’s mostly because in all my life I have never lived, or visited, close enough to cherry orchards. But that changed as we made our way into Washington with the changing of the seasons. 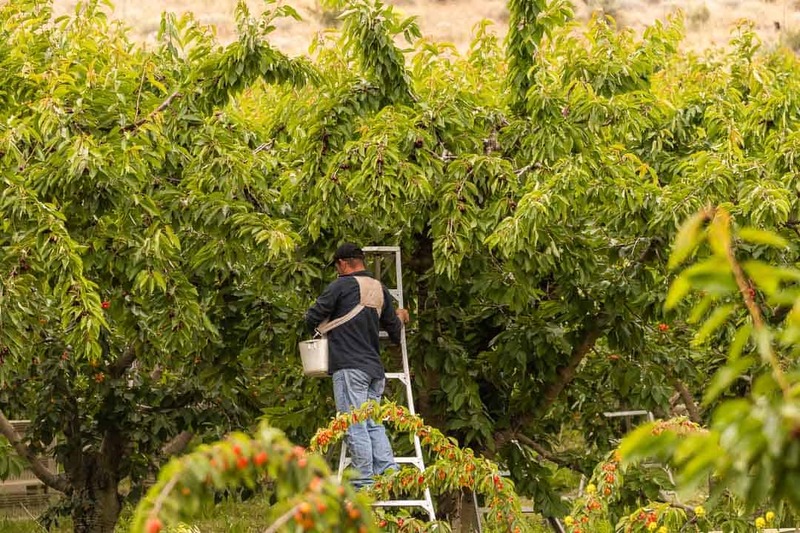 June is cherry picking season in the heart of Washington state. 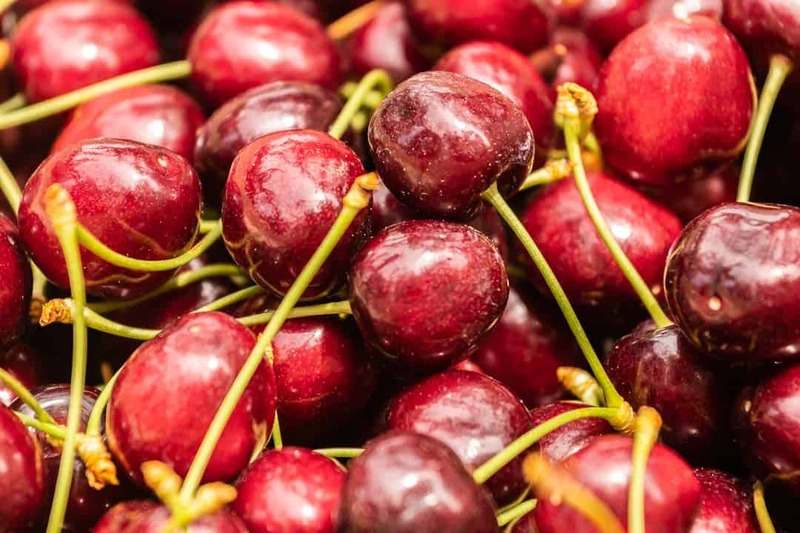 Farmers in the state raise about $1 billion annually in nearly two dozen varieties of cherries. 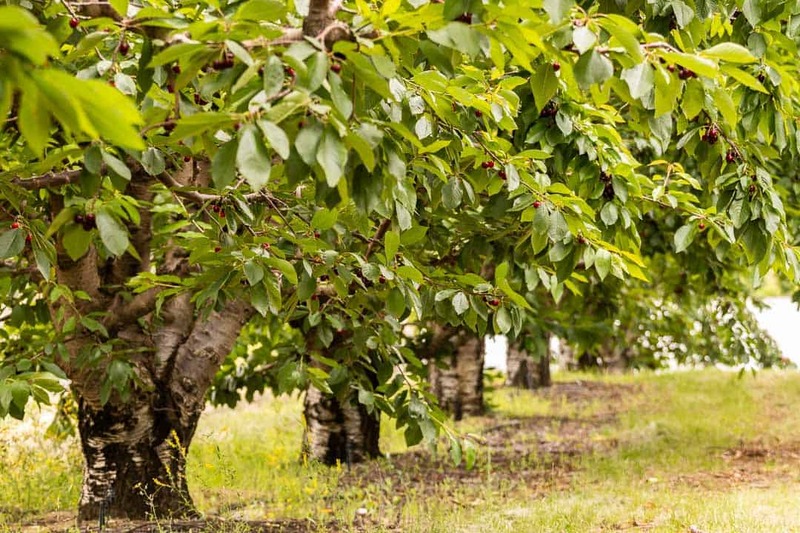 The region itself, including Oregon and California actually produce 97% of the sweet cherries that are grown in the United States. We didn’t know this when we first arrived in central Washington. In fact neither Lindsay nor I care very much for cherries. We don’t mind the cherry “flavoring” found in cough medicine, fruit gummies, soda and the like. But when it comes to having our milkshakes, we’d prefer an extra dab of whipped cream over a cherry on top! We had a difficult time finding a place to stay in Washington over Father’s Day weekend. For the last few weeks of our journey we knew that we were on our way up to Alaska. We had slowly wandered northwest since deciding in early May to abandon our epic 50-state journey. We needed to get back to our roots and calling to simply go to Alaska. As such, we searched for a place to set up camp to get caught up on our blog, do final checks and routine maintenance and to plan our next steps. As such we stumbled into an amazing vineyard through our membership in Harvest Hosts. 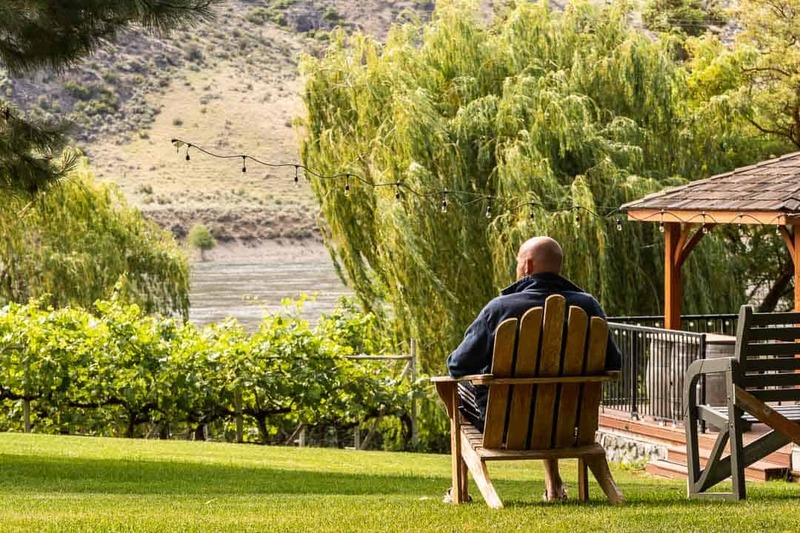 We camped where we could spend a very relaxing weekend among the grapes growing along the Columbia River. That in itself was a feat for the weekend. But it was not without the constant impulse to both to meet new people and to find ways to help them. Chris enjoying the morning views from the vineyard. Lindsay doesn’t sit still much, especially in new places. But I’m the kind of guy that can’t sit still when there are people to meet. One morning I ended up in conversation with the owner of the vineyard. One thing we discussed was that the cherry picking season had just begun at the orchard down the road. He suggested we go and take some photos. I agreed, it was gorgeous and would be quite unique for us. So Saturday afternoon we set out to walk the half mile between the vineyard and the cherry orchard. We had high hopes of capturing some photos of both the cherry and the cherry picker busy at work. After all, we have driven through thousands of miles of various crops and this was the first to actually be in season upon our visit. Lindsay walked the outside of the orchard capturing perspectives she is great at capturing with her cameras. Had I not heard voices inside the orchard and seen trucks parked on the road I might have been content with her photos. However, the extrovert in me required that I investigate the voices to try and gain access to the orchard. I climbed row after row toward the top of the hill and recognized the language as I came closer to the workers. It was very clear to me that they were speaking Spanish. This meant, of course, what every American who watches any news station knows: the workers are likely Mexican or Central American. But that’s great news for me! I speak Spanish… sort of! 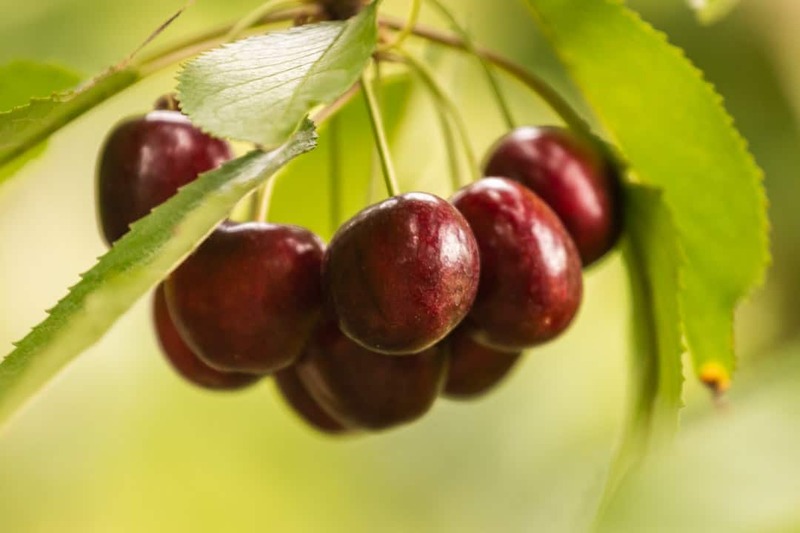 Cherries are more abundant on the top of the trees accessible only by ladder. “Buenas tardes” an echo replied in unison among the workers. At least I knew they were friendly. “Me permite sacar una foto,” I continued a little more hesitantly. (May I take a photo). “Si! Si!” was the response. And then a whole lot of other Spanish I did not understand as it came out so quickly. I took 3 years of Spanish in high school but swore I would never use it. Then I traveled extensively through South America and Honduras after graduating college and I am still upset that I am not fluent. I even have family I consider my “Mexican Family” because of their dearness to my heart. Yet I flail under pressure to communicate. I broke down and told them in English that I do not understand Spanish that well. Yeah, I hear that often I said with a smile. Four of the five men seemed to speak no English. But one man, the “boss” spoke it well enough to communicate. For the next few minutes we searched for middle ground. That’s always the most awkward and exciting part of making new friends. You stumble through the small talk, make assumptions about what a person may or may not know, and try to stretch your truth just enough that you can meet them in their world. We talked about my Mexican Family and the hard workers that they are. I shared that I could never do the work they do, pouring concrete day in and day out starting before dawn. “We don’t wait for sunrise either,” Isaac said introducing himself more formally. At that point we talked about cherry picking. He told me that they were shorthanded on the day. Normally he had a crew of twenty men but they bailed on him. Only four showed up this day and who knows how many the next. “Do you mind if I work,” I asked excitedly. It was both a new and original idea for me. I was an amateur in picking oranges, lemons and blueberries from my time in Florida. Surely climbing a ladder and cherry picking is something I could handle. Perhaps I would even be good at it. A full bin of cherries is a beautiful sight to see. Isaac looked around at the other guys then back at me. “What time do you start,” I asked somewhat afraid of the answers. “We’ll be in the trees by 5 am,” Isaac said with a smile on his face. We left the orchard giddy for the next day. It would be Father’s Day and we knew there would be plenty of father’s cherry picking instead of spending time at home with their families. We know how hard working many immigrant families are and the sacrifices they make for their families. So Lindsay had the idea to cook breakfast for all of the fathers. We ran to the grocery store and gathered up enough bacon, eggs and hash browns to feed a half dozen hungry men. The total came to $25.37, just over our daily food budget for ourselves. But that would be nothing compared to the joy we hoped to bring the fathers in serving them breakfast. When we arrived around 6:30 AM we were surprised to find that there were around a dozen cars and trucks parked by the side of the road. This was far more than Isaac told us and beyond what we had planned for breakfast. Nevertheless I broke out our Honda 2000 generator and set up a cooking station for Lindsay. We carried several small tables with us, a portable propane grill and a flattop griddle that we had used but never to this extent. Cooking for 6 was going to be difficult. Cooking for 20 would be almost impossible. But Lindsay was eager to get started in her makeshift kitchen. 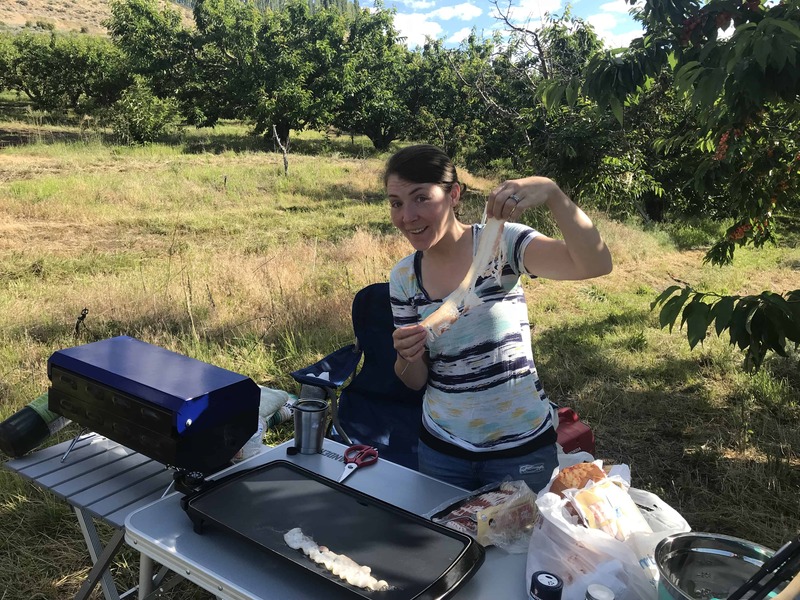 Lindsay at her makeshift outdoor kitchen cooking bacon on the flattop griddle. I was eager to get into the orchard to start cherry picking. But with so many people working I found myself walking up and down row after row looking for Isaac, my “boss” for the day. I greeted as many of the cherry pickers as I could, in Spanish, and received warm greetings that offset what otherwise seemed to be skeptical glances as I passed. No doubt I was the only non-Mexican in the orchard – that day, and likely ever for most of them. After canvassing most of the orchard I was about to give up and go give Lindsay a hand when Isaac pulled up in his pickup truck. “You still wanna work today,” he said matter of fact. “Of course!” I responded excitedly. He parked and signaled for me to follow him up the hill into the orchard. As we walked we small-talked again, mostly about the work. He asked of my cherry picking qualifications, of which I told him I had none. “But I have two good hands and I learn quick,” I said defending my eagerness to work. He said that would do and then we began discussing the terms of the work. “I pay $80 for the full bin. You fill up more, I pay you more,” he said as frankly as he would speak with anyone interested in harvesting fruit. He looked at me as inquisitively as any boss would toward someone who volunteered to work a hard job for free. “What do you mean,” he asked as we stopped. I’m sure he wanted to try and understand more about who this crazy guy was who just walked into his orchard. “You sure,” Isaac responded skeptically. “Yessir. Today is Father’s Day and I am sure some of these men are fathers and I’d just like to help them out a little today.” I shared with him about Lindsay down below cooking breakfast for the pickers as well. “No kidding, you’re doing this for them,” Isaac asked as I hoped he was nearing the end of his skepticism. A row of cherry trees with ripe, deep red cherries ready to be harvested. Isaac took me back toward the corner of the orchard where two men, brothers, were on ladders ten feet into a tree. From below they both looked the same. Tattered and dirty blue jeans, the shoulder harness bucket hanging just above their belt line and the quick movement of hands reaching through sunlight and shade in the trees. Isaac called one of the men, Gilberto, down from the tree and spoke briefly with him. Gilberto ran off down the row of trees. I told him it did not matter to me. Whatever would be best for the brothers would be best for me. Isaac and the man in the tree both laughed. “I think Manuel thinks you’re tall enough to stand on the ground and reach the cherries on the bottom of the tree,” Isaac communicated smiling. “Sure!” I said. I just wanted to just in and get started. Shortly thereafter Gilberto returned with the bucket and shoulder harness and I awkwardly strapped up. All three men snickered at me. I must have looked a little out of place. Isaac gave me brief instructions and an example of which cherries to pick and how to remove them from the tree. After showing him I was capable he turned and spoke to the brothers as they had again resumed their quick picking of the tree. Isaac explained that he had told them the terms of my temporary employment and they were truly grateful for the help. A brief moment later the brothers were back in the tree, Isaac was off being boss somewhere else and I began the first of my cherry picking for the day. As analytical as I am, I started my stop watch to see approximately how long it would take for me to fill a bucket on my chest. I am constantly trying to improve things, so I thought I would be competitive with myself over the course of the day. My first bucket filled up one cherry at a time, then sometimes two or three. But the clock still ran. At around 12 minutes Manuel came down from the tree with a bucket heaping full of cherries. At around 20 minutes Gilberto came down with the same. It took me 30 minutes to fill my first bucket. And I just filled it level, not heaping like the brothers. As I was emptying the bucket into the bin Manuel came back down again with his next heaping bucket. He smiled, patted me on the back and ran back up the ladder into the tree. Chris showing off his first basket of cherries. As we worked we attempted to communicate. I knew a bit of Spanish, but had not truly practiced it in years. Manuel knew no English. But his brother knew about as much English as I knew Spanish. Through the course of the next few hours we alternated between periods of silence and focused work and those of small talk. I came to know that the brothers were 37 and 40 and both were fathers. Manuel had 3 daughters and Gilberto had 5 children. They were originally from Guerrero, Mexico but had immigrated to the US over a decade prior. Since they arrived in the US all they had known was seasonal agriculture work. Like many migrant workers, they followed the harvest trying to find work where it was desirable and trying to avoid the jobs that were the most difficult. Over the course of time they had “settled” in this part of Washington and had become proficient with cherries. In the summer they harvested the cherry trees. They pruned them in the winter. In between they worked the apple orchards and vineyards and did the occasional construction work. They always worked, they said. There was never much time for anything else. I also learned that their families lived in a small town that was about 2 hours away. Because they started work so early, arriving at the orchard by 5 am, there were days they would not even make it home. It was tough work, for sure, and a tough life. Cherry picking for them for a day was the least I felt I could offer. I checked on Lindsay and breakfast in between buckets. She had masterfully cooked a feast and had made friends of her own among the workers. It’s difficult to smell bacon anywhere and not perk up. But as you’re cherry picking in the heat of summer the smell of bacon is that much more enticing! Isaac came back around and I told him that breakfast was ready. He pretty much had to pry the brothers from the tree. I knew why, of course. A break – any break – meant less cherries. Less cherries meant less pay. Less pay mean, well, another long day manana. “Tell them when they return from breakfast I will have filled their entire bin,” I yelled at Isaac as the men walked away. I heard laughter soon follow and was glad they were in good spirits about taking a break. Chris with his tree-climbing, cherry picking brothers. By the time I took my break to join the men Lindsay had fed most of the workers. Some, I think, were skeptical of the offer for “free” food. Others brought their coolers and sat down and enjoyed a hot meal and a cool drink. I was grateful as much for the break as for the breakfast. My hands were already filthy and I could feel my thumbs and fingers going numb from the perpetual pinching of the fruit. As we wrapped our break and headed back into the orchard Isaac pulled me aside. He said the men had collected money to give us for breakfast. Isaac was perplexed again. However since I have learned that part of giving to others is being willing to receive when someone gives to you I did briefly accept the payment. Pride rears itself in the most unsuspecting places. In a time like this, pride could easily have told Isaac that we would not accept the gracious kindness of others. But in accepting I did turn around and give it right back. “Ok man, if you say so,” Isaac responded with a smile. I think he finally figured us out. In all I cherry picked for four hours that day. We stopped just after noon when the sun became too hot for the harvested fruit as it sat in bins waiting to be filled to the brim. It was getting to be too hot for us too. But the fruit had greater value, I knew, and all the men would continue to pick if they were permitted. I harvested about eight baskets in my four hours. With the breakfast break and a few brief water breaks that put my average around one basket per 30 minutes. The brothers worked nearly twice as fast as me. But of course they were far more experienced. They also had the benefit that more clumps of grapes grew at the top than at the bottom. We could not skip trees, or parts of trees. They would have had to come down at some point to slowly collect the cherries off the lower side of the tree. Deep red cherries ripe for harvesting. So if you factor in that I was helping them do the work that was worth less per hour, it really benefitted them to remain in the tops of the trees that day. I could care less where I picked. I was just glad to help them. Isaac told me that he paid $80 for a bin of cherries. It took approximately 18-20 shoulder baskets to fill each bin. The brothers were clearly faster than I was, but if you look at it this way, I figure this is the true payment for harvesting cherries. In effect I could say that I “donated” $32 to Manuel and Gilberto over the course of the day. I’m not going to lie, that is a LOT of work for such little money. But that was part of the lesson for me that day. 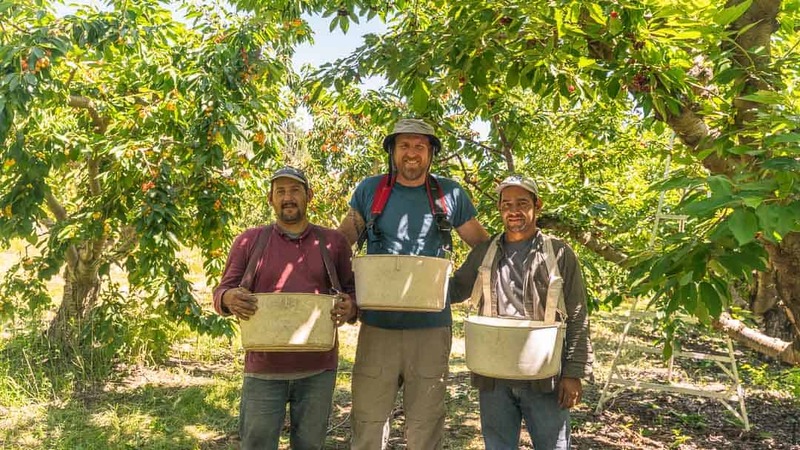 I have heard countless times of late where complaints have been raised politically that constricting the flow of Mexican workers will reduce the agricultural workforce and ultimately raise the cost of produce. Politics aside, it is safe to say that the American agriculture workforce is primarily hispanic. It is likely to remain such regardless of political structures and interferences. The work is hard. It pays very little. You have to go into it willing to work as a team. You work rain or shine; hot or cold. Isaac told me that in nearly 30 years of him working in agriculture in the United States I was the first “white” person to come to work with him. No doubt those in the orchard with less years of work must have the same experience. This is not to say that I am special. Nor am I the only one across the country to have worked as such, on this day or any before or after. It is simply to say that Lindsay and I stumbled upon a very unique opportunity to serve people who are under-appreciated and overlooked in society. We were grateful for the opportunity to serve – both breakfast and in cherry picking – and we would do it again in a heartbeat. We have remained in touch with Isaac since we left the orchard at the end of the day. He invited us to visit his family outside Yakima to spend time on his “ranch,” a smaller version of what most people would consider such. He raised sheep and would host us for as long as we would stay. Like what you’ve read? Please consider DONATING to help us continue to help people as we travel!